1971- The year we started off producing toys at the residential backyards of Jalan Sahabat and the company were then known as Cheap Hin Toys Manufacturing S/B. Headed by a partnership of 3 childhood friends and with a workforce of about 20 people, we grew and expanded gradually and had to shift to Kampong Cheras Baru due to space constraints and zone gazetting by the authorities. Soon after in 1983, our operations had a streamline exercise and we registered a new company known as Sri Cinmal Sdn Bhd, which simply means bright in the local Bahasa Malaysia language for Sri and cinmal is short for Chinese and Malay. Yes, it was one of the criteria back then for licensing with the authorities. Cheap Hin remains then as a retail and headquarters at Jalan Tun Tan Cheng Lock. 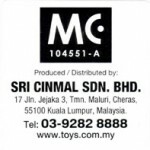 In that very same year, we shifted to the current address at Semenyih, Selangor with a ample space of 10 acres mainly producing toys such as, puppets, pvc playballs, premium items such as advertising balloons/tee shirts and also coin boxes. Member of FMM (Federation Of Malaysian Manufacturers) Copyright © 1998-2012 Sri Cinmal Sdn Bhd. All Rights Reserved.